It was forecast. Highly anticipated. We refreshed the weather app every hour, we mentally prepared for the significant shift in the days activities and awoke early to jump out of the warm cosy bed and sneak a peek through the curtains onto the street beyond. Not your usual Sunday morning. With a glint in our eyes we welcomed the children into our room in the usual way but with excitement bubbling over like Christmas morning the urge to burst open the curtains was all too much. No longer were we trying to eek out the time snuggled together before we started our day but were itching to get up and share it. They stared out in wonder, disbelief and excitement with their faces so close to the pane that their hot breathe could be seen on the glass, and quickly wiped away so as not to obscure the view. The rooftops were covered, the cars were untouched and there was a stillness in the air as you could see, balancing gently on every single leaf and branch in sight,…..SNOW! 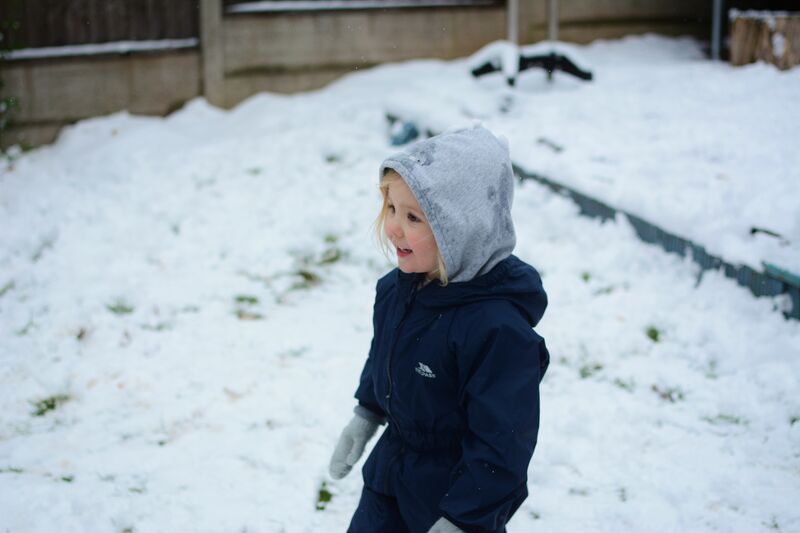 The children ran around the house shouting “SNOW SNOW” as loud as they could, each one’s excitement feeding off the other and Eddy and I standing there smiling as they rummaged for what might be appropriate snow wear. Despite Eva being a little poorly and up in the night they still wanted to go straight out in it and be the first to step that tiny footprint into the deep crunchy undisturbed carpet of white stuff. Yet we already had plans! Roma was to go to a party, not just any party but her first nursery party, at 9am so we were up and out braving the snow to drive to a local town that usually takes around 20 minutes. Well, given how we deal with snow in this country and despite it being fully expected, that short journey took over an hour and upon arrival the party had in fact needed to be cancelled! A quick trip to my sister who thankfully lives nearby for a cup of tea and we braved the journey back vowing never to drive in the snow again! I couldn’t even get the car back on the drive as we returned home and the roadsides were littered with abandoned cars who had gotten as far as they could. There was only one thing for it. A snow day! That did however mean that we could play, and play we did. We wrapped everyone up in waterproofs and all in ones to go into the garden, sledge, make a snowman, jump on the snow covered trampoline (who knew this was the best fun ever) make snow angels and throw snowballs at unsuspecting people (I’m looking at you Eddy Steer) The girls thought it was the best fun ever, and quite possibly the adults too. 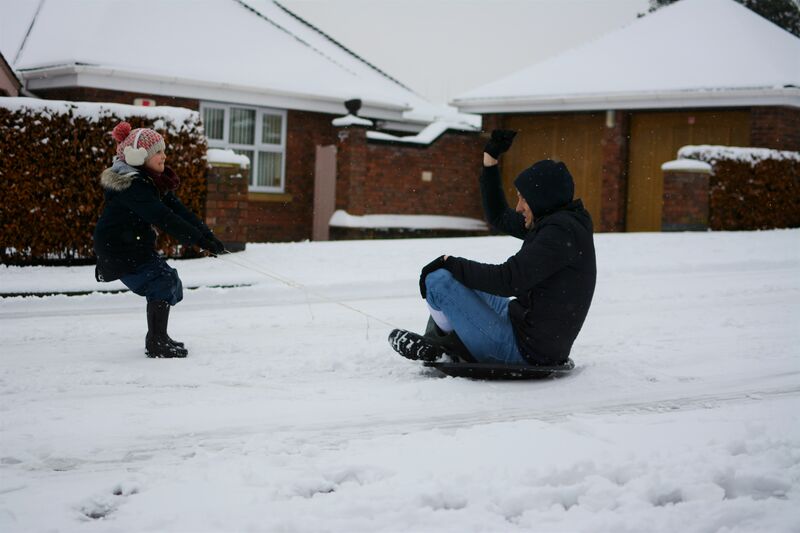 So much fun from some simple snow. 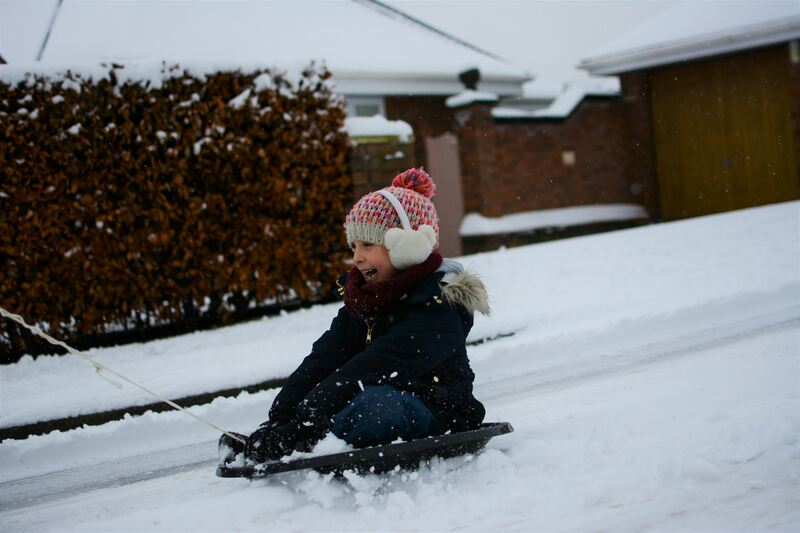 That is of course until we said they could go sledging on the street outside the house and that just blew their tiny minds! Roma, who insisted in calling it a sleigh and not a sledge (sooooo cute), wasn’t so sure after Eddy was perhaps a little too rough in the garden but Eva must have gone up and down the street a hundred times. Poor Eddy! 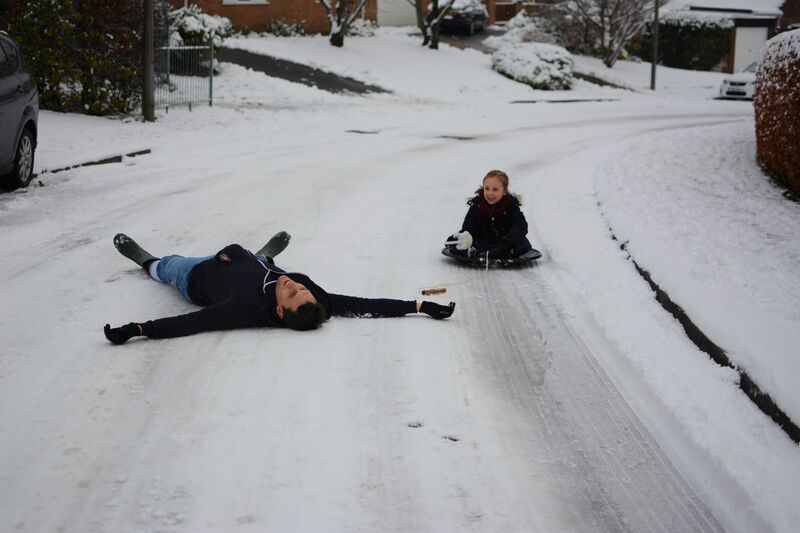 She kept falling out or losing her grip and just laughing it off as she lay on the ground covered in sleet and snow, Eddy would pull her along and laugh as she squealed behind him in the most infectious way asking for more before she had barely stopped at all. She even tried to return the favour bless her and pull Eddy, she insisted on trying but it wasn’t going to happen as this Daddy tried to tuck his 6ft 3 person onto a tiny circular black piece of plastic! I had a go too until finally it was time to give Eddy a rest and come into the warm. I swear Eva would have stayed out there all day if she could. Automatic sledge anyone!? It barely stopped snowing all day and is definitely the most amount of snow that either of the children have ever seen. It has snowed I think every year since Eva has been born but not this much. 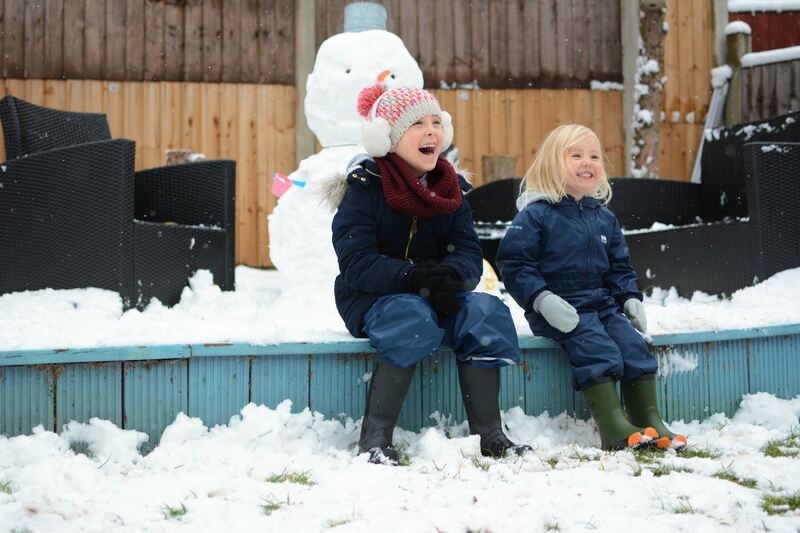 I remember one boxing day it snowed because I was heavily pregnant with Roma at the time and I remember praying she wouldn’t come as we had Eva’s birthday to go first and I couldn’t possibly have a baby in the snow!! It is quite possibly the waddling with ice under foot at 38 weeks that I remember the most! There was also snow in march one year when Roma was just a year old because she was not a fan at all and spent the whole time crying and not wanting to be put down. That first snow experience must be so strange. What a difference a year makes ey. Today is was nothing but exciting. There is also something special about the community feel that the disruption of snow fall brings. People walking to the shops, helping one another out with shovels, or cars, or grit. 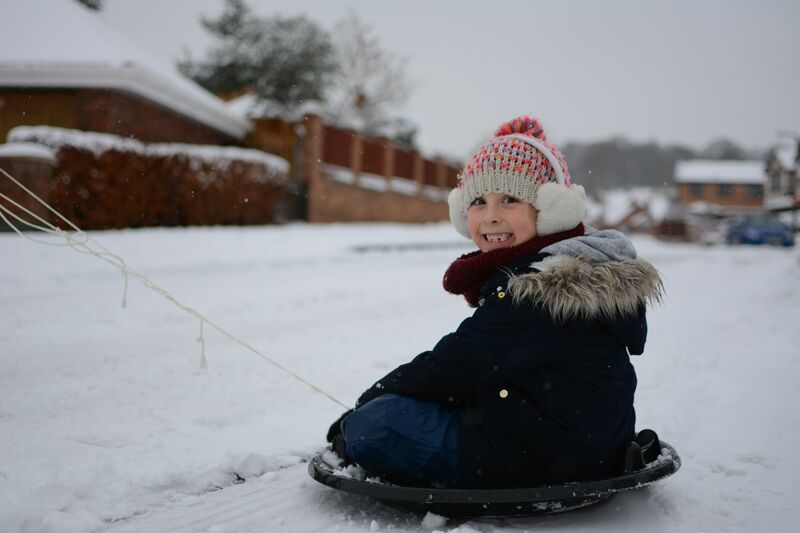 Children sledging down the street that is usually reserved for cars rushing around about their lives, squeals of joy and smiles from dog walkers going by and families just all together. It really felt like an extra Christmas day where noone is rushing and everyone just takes the day at their own pace. 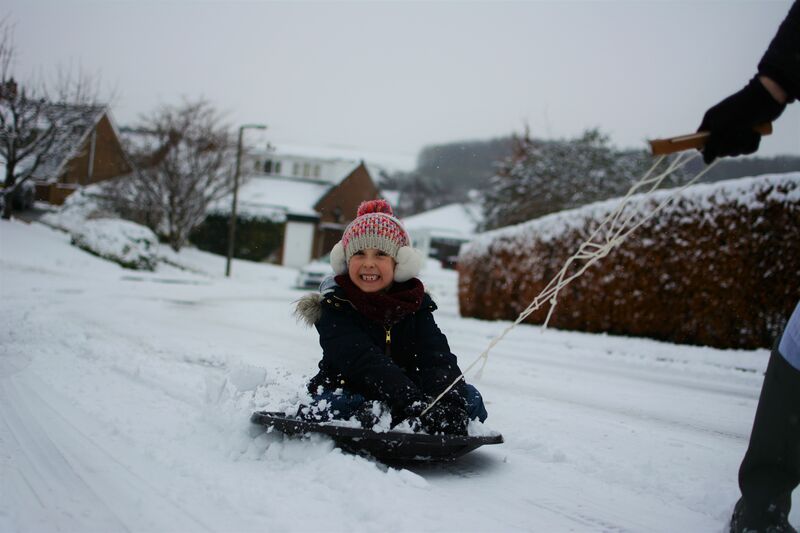 after going to the local shop on the sledge, (which Eva said was the best thing ever) Eddy, Eva and I went outside and Roma stayed in with my sister just looking on and I stood there in the middle of the street thinking how lucky we are. No the UK isn’t great at snow days, we’re not great at still going about our days or carrying on as normal but as I stood there that cold afternoon I could not care less, and honestly I was probably a little bit thankful for that, for this extra bonus day of no pressure, no to-do list or plans, but a pause button to enjoy the community, the sense of quiet and the beauty that this snow day brings. 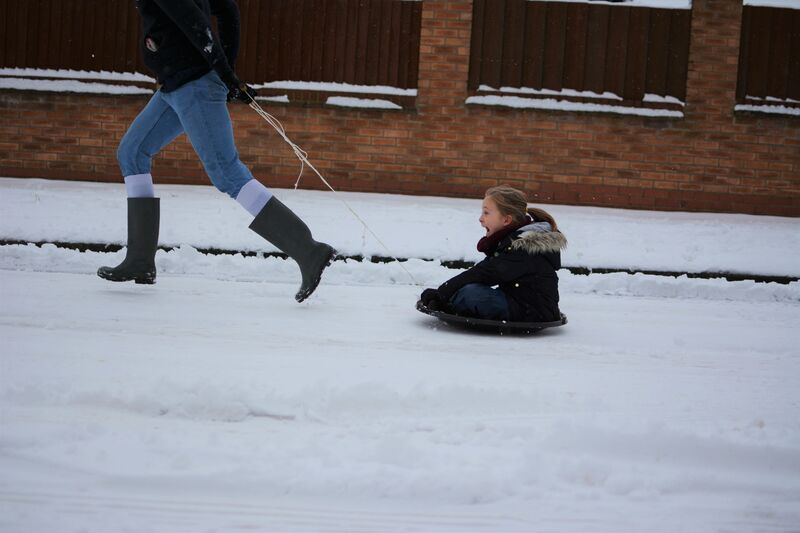 We even took both of the girls sledging in the dark, they took turns, they ran up and down the street after the other by streetlight and they even had a go on the little sledge together. It was a day to remember and one I will not be forgetting in a hurry. 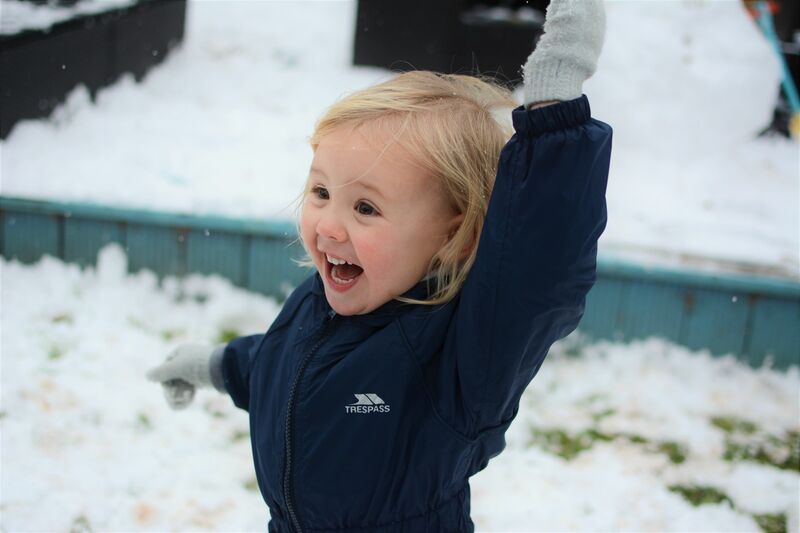 Despite the disappointment of the cancelled party, the changed plans and the poorly Eva there is nothing like a snow day to put it all into perspective. The ordinary moments will always be the best. There was so much they had the best time! 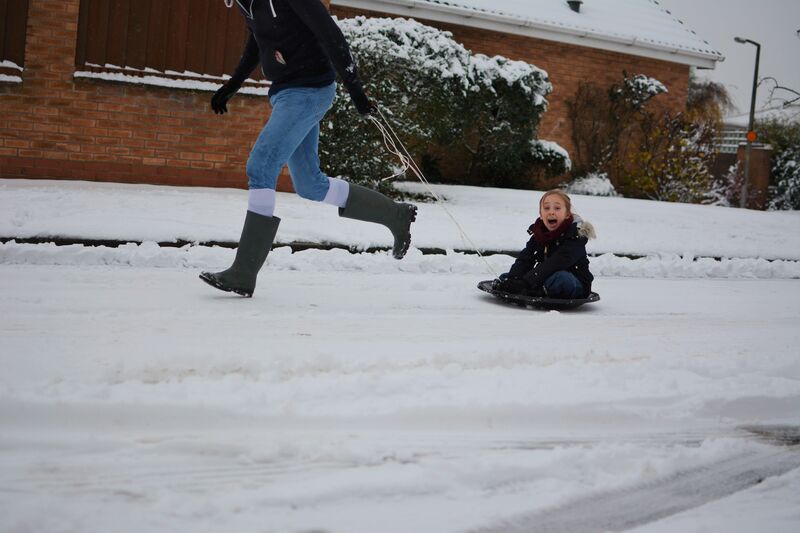 Ah such a shame, snow days are the best when you have a lot aren’t they?